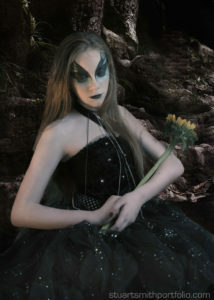 It is great to be introducing stunning new model Lochan Cash in a Dark Faerie inspired Fashion Photoshoot. The chance to work with this upcoming new model arose because Lochan and her Mum and Manager, Claire, had been looking to do something different in terms of the fashion look for her daughter’s developing model’s portfolio. 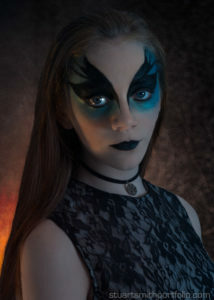 We collaborated and brainstormed ideas and came up with the concept of a 3 outfit shoot based around Black Swan inspired makeup with a sense of the Faerie world in it. The Makeup Artist was the very talented Jola Łukasik. The photoshoot took place over the course of a day at a London apartment location. As well as creating the specific looks I also worked with Lochan to produce some standard make-up free photographs for potential agents and bookers looking for a new model. Lighting was predominantly via two speedlights with modifiers. One had a CTO (colour temperature orange) gel to give a little more edge and atmosphere to the images. The resulting photographs demonstrate how one makeup look can be applied to several different looks and outfits. 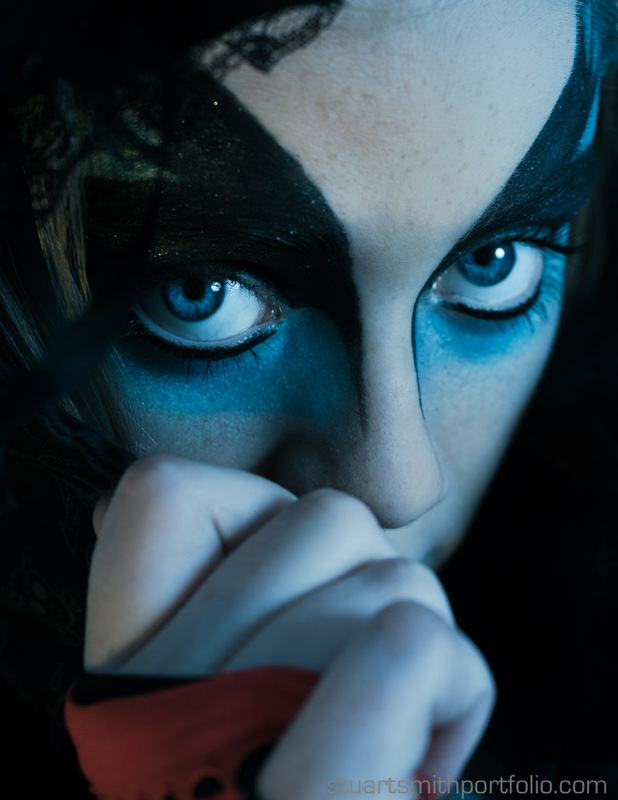 It also gave the chance to Lochan to experiment with character in front of the camera. The resulting fashion photographs and portraits demonstrate how one makeup look can be applied to several different looks and outfits. I composited a few of the images into abstract and woodland settings to give a more ethereal feel to the edits. However, with Lochan’s third outfit giving a steampunk feel and I decided to leave her in situ and keep the surroundings simple. Lochan was brilliant to work with. She worked really hard and well with the creative team on the photoshoot. I love working with upcoming new models to help develop their portfolio and skills. I particularly enjoyed helping Lochan add more dramatic diversity to her portfolio in this photoshoot. If you are an upcoming new model and want to develop your portfolio with me please get in-touch.